Suppliers of Quality Engine Parts. Ford 1.8 TDCi Wet Belt Timing Cassette Kit. Fits Models: C-Max, Focus, Galaxy, Mondeo, S-Max, Transit Connect, Engine Code: BHPA, FFBA, FFWA, HCPA, HCPB, KHBA, KKDA, P7PA, P7PB, P9PA, P9PB, P9PC, P9PD, QYBA, QYWA, R2PA, R3PA, RWPA, RWPC, RWPD, RWPE, RWPF. Please see tabs above for more information. BHPA FFBA FFWA HCPA HCPB KHBA KKDA P7PA P7PB P9PA P9PB P9PC P9PD QYBA QYWA R2PA R3PA RWPA RWPC RWPD RWPE RWPF. 4 cylinder 8v Turbo Diesel. We supply a large range of engine parts for cars and commercial vehicles. We aim to reply to emails within the hour during office hours and we check them regularly outside of these hours. 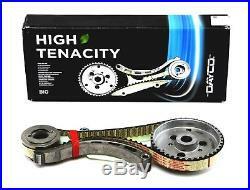 The item "Ford Transit Mondeo Focus 1.8 TDCi Wet Belt Timing belt cassette kit 1562244" is in sale since Friday, October 12, 2018. This item is in the category "Vehicle Parts & Accessories\Car Parts\Engines & Engine Parts\Belt, Pulley & Tensioner Kits". The seller is "lymmengineparts" and is located in Warrington. This item can be shipped worldwide.